Headache and Migraine Relief with Chiropractic Remedies, because you’re tired of living with headaches and the endless medication that comes with it start using our natural techniques. Add this to doctors’ visits, MRI’s, CT scans and x-rays — which only come back with “normal” results. 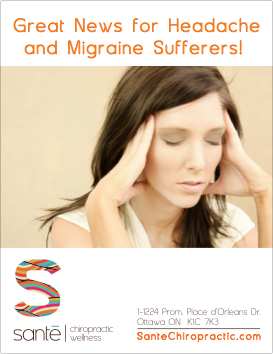 1) Approximately 22 million women are affected by migraines in North America. Download FREE e-book: Great News for Headache and Migraine Sufferers! Two non-invasive neuro-spinal scans which will evaluate and assess the function of your nervous system and of the muscles that support your spine. A full set of specialized x-rays to determine if posture or joint problem is contributing to your pain. A special report accompanying your recommendations that reveals the foods you should never, ever eat when suffering from chronic headaches. You’ll get everything I just listed for $35. Recurring Headaches Are Not Normal!!! No question… if you are having headaches then something is wrong. Pain is your body’s way of telling you something is wrong. Finding the problem and fixing it has got to be top priority! Call today… or schedule your appointment online. For Many Women, There Is Hope. You Just Need The Right Plan. Call anytime between the hours of 9:00 am and 6:00 pm Monday through Friday. Tell the receptionist you’d like to come in for the Special Headache Evaluation you saw online. Look, you have very little to risk and a lot to gain. Call today and we can get started with your consultation, exam, x-rays and scans as soon as there’s an opening in the schedule. Our office is called Sante Chiropractic Wellness Centre. Dr. Nathalie Beauchamp, B.Sc., D.C.
How many years can your body handle taking one pill after another? That’s no way to live, not when there could be an easy solution to your problem. Many of the pain medications available are quite addictive and can have drastic side effects. Call today. I may be able to help you live a normal, pain-free life again. Discover the drug-free, pain free and natural solution for getting rid of headaches.